My brother and his family and my dad went with us for my vacation bbq lunch. 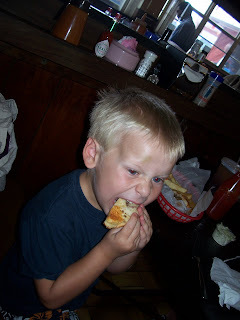 Here is S taking a huge bite from his bbq sandwich. 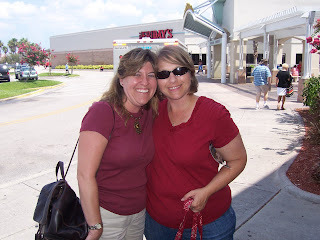 In addition to a trip out for bbq, my sister in law, Paula, and I took the 6 kids all over the place. One morning we went to the theater that was showing a free kids' movie. On our way there D got sick and while Paula, Ever-Brave-Paula, took the 5 non-barfed children in to see Barnyard D and I went to KMart to buy a quick change of clothes. When D and I got back to the movie theater the lady at the counter was all in a tizzy because, well, I'm not really sure what exactly was getting her knickers in a knot, but she was on a rampage. The only thing D said was, "Mommy, that lady talks FAST." Well, no, son, she doesn't; you've just been living in the South too long! Another afternoon we went to a different theater to see Spiderman. 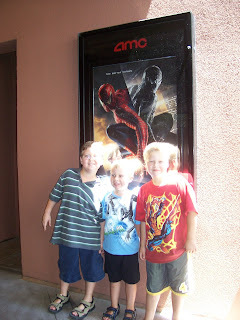 Part of A's birthday plans was to go with my friend, Susan's kids to see Spiderman. So, Susan's Dad and her two older kids joined us for Spiderman. D came with the Spiderman watchers. Paula and my Dad took the girls and S to see a different movie. 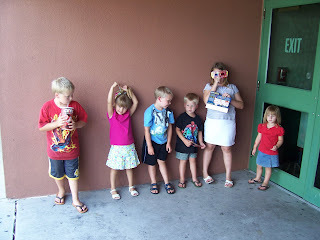 This is a picture of my three boys and Paula's three girls at the movies. ning commentary" through the movie! Hello there! Thanks for your comment on my blog. :o) Looks like you had a fab time at the BBQ spot. I would love to see Florida. My sis-in-law just arrived back from a trip to Florida. In fact, we will be collecting her from the airport in about two hour's time, here in Durban (S.Africa)... Love the pics you posted!